All of the apprehension fans of the series have exhibited over the prospect of a SimCity game requiring an internet connection to play, justified in a single message in the top-left corner of my screen. Earlier today I mentioned I have had no problems playing my copy of SimCity. It had much the same effect as a sad sack character in a comedy movie saying, "well, at least it's not raining." It rained. This afternoon I've struggled with connection issues, server down times, a bit of queuing and even that same "unable to load the city" error that plagued me during the press early start. As of this writing everything is working fine. I probably should not have said that. Regarding the issues, Origin spokesman John Reseburg gave me the following statement, which has also appeared on the official Origin Twitter channel. 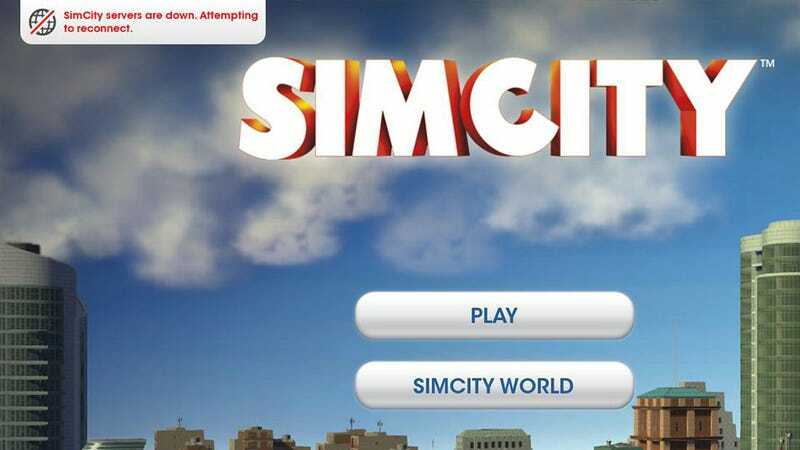 "Due to the high demand for SimCity, Origin has experienced some delays that have impacted a small percentage of users. The team has been working non-stop to resolve. We are also making changes to prevent further issues, and we're confident that the Origin service will be stable for our International SimCity launches later this week." Aren't you UK folks glad you had to wait three days?